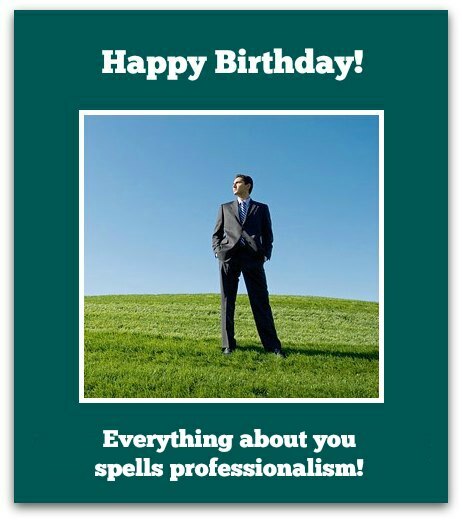 Immediate access to the right colleague birthday wishes for a birthday card can only make your job easier. Luckily, that's what you have here: the only birthday messages on this page are the right ones. As you search for the perfect one below, you should really be looking for coworker birthday wishes that do one thing (and do it well). What's that? You need to find something you truly like about your colleague and include this sentiment in your birthday verse. Anything else will just look insincere. Here are a variety of colleague birthday messages, giving you many birthday wish options to choose from. When that dreaded office birthday card for one of your co-workers comes around to your desk, you want to be sure you have just the right colleague birthday greeting to add. Am I exaggerating the importance of this moment? Not one bit. What you write in the card does make a difference. Co-workers have long memories and will most likely hold a grudge against you if you write something even the slightest bit offensive. Bottom line: writing birthday wishes for colleagues that are inappropriate can only make your job tougher. Sounds silly but wouldn't you be peeved if somebody wrote you a birthday message that left you sad, angry, insulted or, worse, harassed. Granted, writing birthday wishes for colleagues is no easy feat. If the message is too cold, it may suggest you don’t like your co-worker — not ideal if you have to work with him or her every day. Of course, very personal greetings may imply the opposite: you like them too much and lead to a very unpleasant experience (maybe litigation). Even an off-the-cuff remark about your colleague's wrinkles may get you sued for age or discrimination. So what should you do? 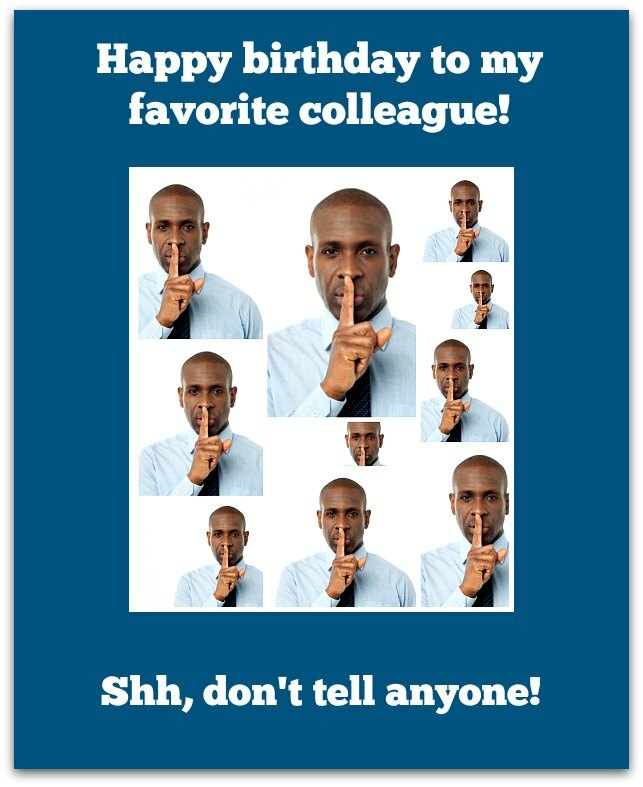 To make your co-workers feel appropriately special, go for simple, respectful and/or humorous colleague birthday wishes that can only be taken one way: in a good way. That's what you'll find here. Working with anybody else would just be a drag. You make work a fun place. Happy birthday. Today is a special day at work. I think they started serving sushi in the lunchroom. Just kidding! I know it's your special day. Happy birthday! Hoping you get a big promotion and an even bigger pay raise this year. You deserve it. Besides, it's about time you picked up our lunch tab. Happy birthday! Getting the right colleague birthday wishes may seem like an impossible task. When you don't know what to write and you just want to go the safe route, the message here is the way to go. It has all the elements you need: respect, admiration (but not too much admiration) and, most importantly, the appropriate amount of professionalism. Wishing "Happy Birthday" to you is a privilege. Working with you has shown me what dedication, honor, respect, hard work and professionalism mean and what they can accomplish. Happy birthday! Happy to the Employee of the Month (in my books, at least). With a coworker like you, I don't think I'll ever have to look for another job. You make work more rewarding and, more than anything else, super fun. Working with you is truly a joy. I consider you the second-best co-worker here (I'm the first, of course). Happy birthday! Happy birthday! You deserve a carefree day. That's why I've decided to do your work today. Tomorrow, of course, we'll go back to usual — you know, you can do my work. You brighten up everybody's workday with your sparkling personality. You're a shining example of what makes good co-workers great. Wishing you a birthday as spectacular as you are. Every day, time just flies at work. That's because of you. You strike the perfect balance between professionalism and fun! Happy birthday to my favorite colleague. You're so lucky! You're not only another year older and wiser — you're another year nearer to retiring. Happy birthday! Happy birthday! Why don't you just take off the rest of the day and I'll cover for you. That's what good co-workers do for each other (remember that when it's my birthday). Just wishing you a "happy birthday" is not enough. As my favorite colleague, you deserve more. So here it goes...Happy birthday to my favorite co-worker! As a co-worker, you're the best — probably the best I've ever known. You're there when I need a helping hand or two or three or more. Happy birthday! co-worker a truly super birthday! So...Have a supercalifragilistic birthday! Co-worker" more than anyone else in the office. I'm so proud to call you a colleague of mine!